Egg: white to grey, smooth-skinned, to 30 mm diameter, with white rhizomorphs at the base. Pileus: the stipe is topped by a disc and a radiating ring of 8 -12 separate, white, tentacle-like arms; 40 × 60 mm; tapering towards the tip, hollow with a single chamber; some of the tips may be linked by cobweb like threads. Stipe: cylindrical but tapering a little towards the base, hollow, sometimes with a round opening at the top; 100 × 25 mm; wall is composed of a cellular structure, surface may be slightly wrinkled; white. 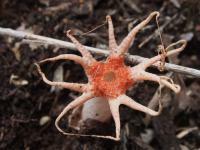 Notes: stinkhorn is recognized by the threads that link the tips of the arms on top of a white tube like base.